The Chicago SOFA (Sculpture Objects and Functional Art) exposition was quite inspiring. I would say that the dominant medium was clearly glass, in myriad forms. Technical feats of magic were well represented. Lampwork abounded, from overly simplistic bead jewelry to lethal collections of glass needles to delicate layered curves floating in space on monofilament. 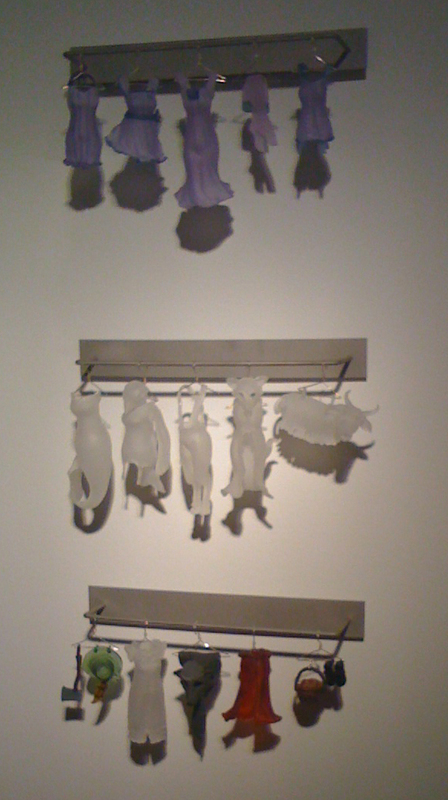 One of my favorites was the novelty of Carmen Lozar's "Couture" collection, a series of tiny wearables hung on hand-formed metal hangers. Little Red Riding hood was so clever -- a red hooded cape, a basket, a wolf skin, etc. Each glass piece was just a few inches tall. All but one set had unsurprisingly sold halfway through the show. 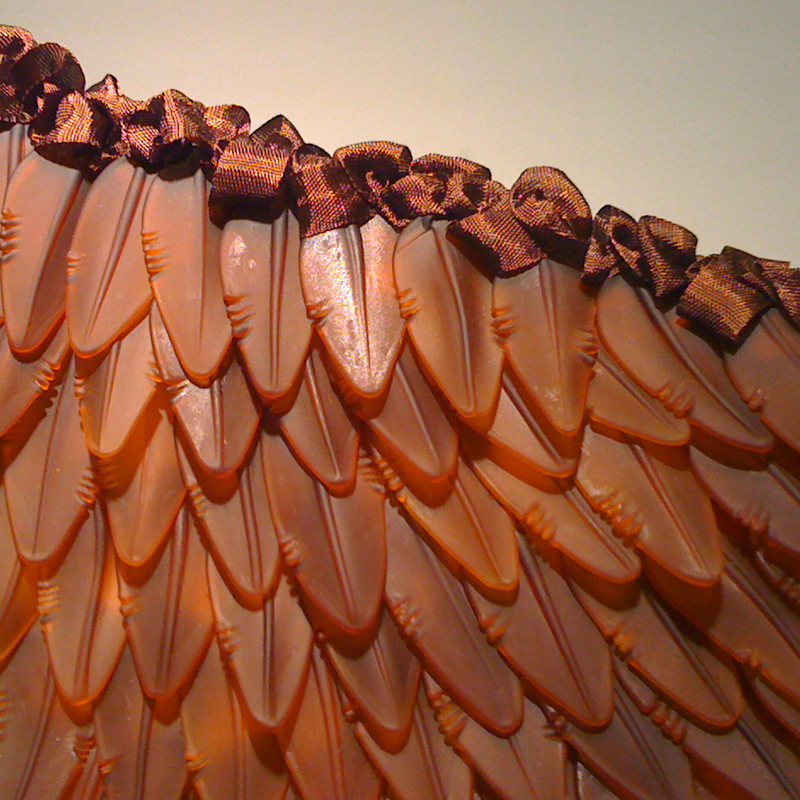 Paul Stankard's website has an article he wrote about her glass work and a nice detailed shot of "Dress Set." 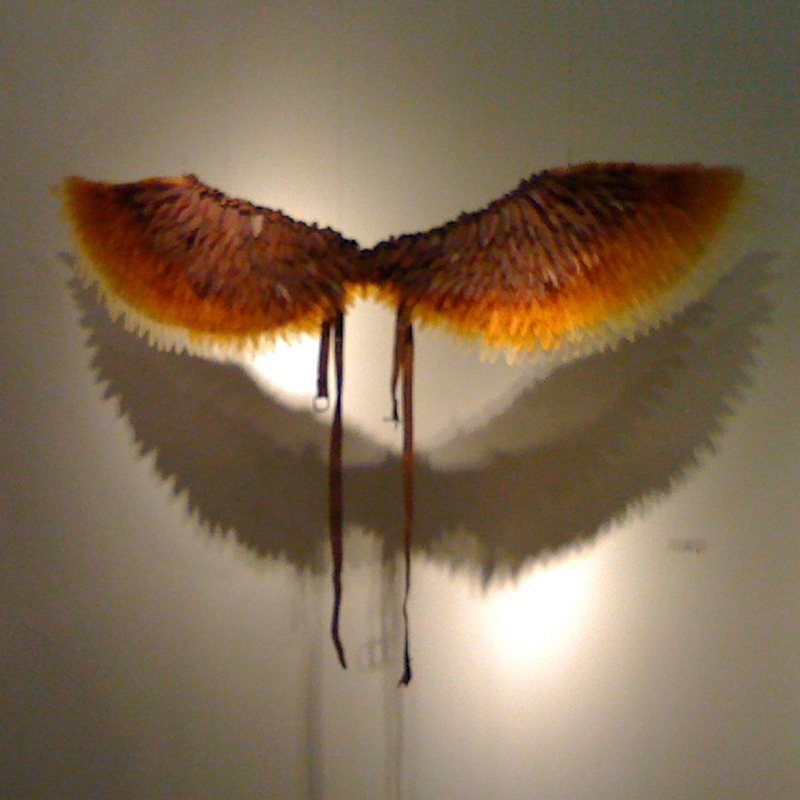 There were three different sets of wings, but I daresay this might be the last, most refined of them. It was especially interesting in that it was a collaboration between two artists, Tanya Lyons (a fiber and glass artist) and Mathieu Grodet (a mixed media glass artist). 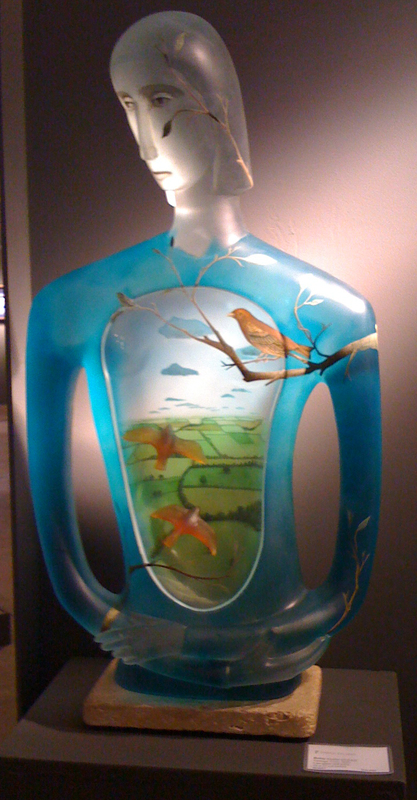 It was also a pleasure to see one of Robin Grebe's graceful glass torsos up close, to marvel at the suspended amber birds and hand-painted idyllic aerial scenery and theorize about the process. Many more visuals crowd my memory of the whirlwind visit. Luckily I got to go twice, on both Friday and Saturday (the leg couldn't do a super long session), which allowed my recall to solidify. I have many mental images of fabulous jewelry, more than I remember at my first visit two years ago. There was a notable lack of art quilts, which was at a low, but higher level, on my last visit. Overall I thought the booths were larger, more impressive, and the work was even higher quality than before. It was a pure delight to wander around, recognizing work by favorite artists, finding new artists to follow, and being inspired to go further. The whole point of visiting, for me, is to fill the well. The past year has certainly been a withdrawing period for me, and now I find myself gathering to spring forth again. Among my thoughts lately is one of direction. What do I do next? What is my target? My son started homeschooling ten years ago, just as I was reaching a critical point in my quilting career, when my work was appearing in serious juried exhibitions and gallery representation was on the horizon. 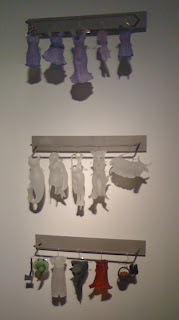 I visited many booths over the weekend with work by artists who showed in some of those same exhibitions ten years ago. It was a rather bittersweet thought -- I could have been there potentially. The child took priority, and I have no real regrets, but he will graduate next year. It's time to start thinking about that shelved career. Do I return to the fiber arts? Do I veer off into glass or metal? Do I combine them all somehow, as I usually believe? Do I follow my peers of recent years, teaching and selling at bead shows, or do I return to the lofty aspirations of making detailed, over-the-top, time-intensive work that can only sell to collectors with deep pockets? My heart leans toward the latter. "return to the lofty aspirations of making detailed, over-the-top, time-intensive work that can only sell to collectors with deep pockets?" You are a fantastic artist. That is the part you need to keep going with. There is nothing else when you have that. There are already many people that teach. Love the wings and the amazing torso. Thanks for sharing this Vickie !! Roberta, your comment brought me to tears. Thanks for the much needed support. My response told me so much that I needed to know.